Doodly doo, don't mind me, just closing the loop here. This is my main—a.k.a. spacefood—dinner actually, four times a week before I work out in the evening. I'm still working on eat fish and vegetables for dinner three times a week for when I don't have an evening workout. I did come up with my own fish taco recipe, it's very good! TK! The cue for my spacefood dinner is getting home from work or finishing up my work at home and having to fuel up for my evening workout. 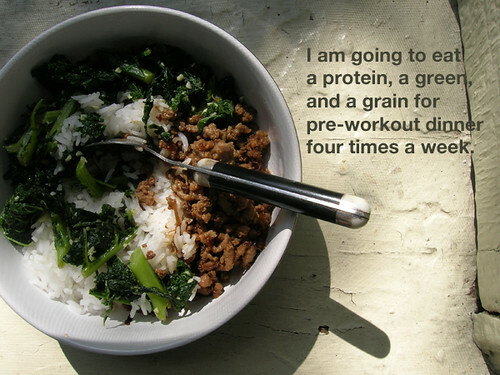 Another perfect example of a how a habit loop is formed: it took a few iterations to get the bowl right, and it seems like little bit of meat, a little bit of greens, and a little bit of rice is the right balance so that I do decently at practice, and that ensures I will do it again and again. Achievement unlocked.